Some people put up a big world map at home and stick pins onto it to keep a record of where they have gone around the world. This is the same, just that it is online, save on pins, paper and wall space, thanks to Trip Advisor. There was supposed to be a family trip (my bro, SIL, dad and wifey) to Shanghai this week, but then wifey had a conference in Stockholm last week. So what happened was we postponed the family trip and I took this opportunity to tag along to Stockholm just "for fun". Although it was just a week, it was pretty exhausting, but enjoyable. The weather in Stockholm and Copenhagen was cold (about 15 deg C in the daytime) but still ok. The weather was mostly cloudy and overcast, although we did get some sunshine and rain as well. Singapore-Bangkok-Stockholm-Copenhagen (for wifey it was Singapore-Frankfurt-Stockholm-Copenhagen). Yes, we took different flights, cos she had to drop by Finland on the way back, and also not to mention her company paid Lufthansa tickets cost S$1K more than my Thai Airways tickets! However, because of the different flights, I arrived early in Stockholm and had to wait about 5 hours for her. I can tell you that Stockholm Terminal 5 is a very boring place to spend 5 hours! By the time we got to Copenhagen, we were pretty tired. Only managed to visit some of the sights around the city centre (near the Central station) from 7pm onwards. 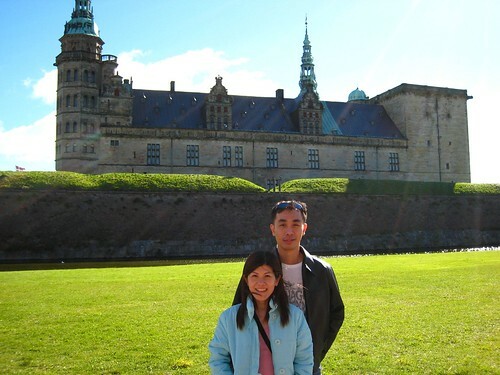 Visited Kronborg Castle (Hamlet Castle) in Elsinore (Danish: Helsingør) and also the original Carlsberg factory for tour and beer! After that, went to Dragor (small seaside town) for dinner. Went to say Hi to the "Little Mermaid" (Den lille havfrue) early in the morning before our flight back to Stockholm. It was super cold and raining but yet we made it! Took flight to Stockholm and went out in the evening to walk around Gamla Stan. Had McDonalds for dinner. Took a boat ride to a small town called Vaxholm, the "capital" of the Swedish archipelago. After that, we took a bus back and went straight for the Vasa Museum (Swedish: Vasamuseet) before it closed. The original 300 year old warship was impressive. It was sunk in the 1600s, survived 300 years in the brackish water, raised off the sea bed and restored in the 1950s! Wifey had conference today, so I spent the day wandering around Gamla Stan taking photos. Managed to catch the change of guard ceremony at the Stockholm Palace (Swedish: Stockholms slott). Wasn't much to shop as the stuff were pretty expensive. Wifey had conference today also. Idled in the hotel till noon before heading out to Sigtuna, one of the oldest towns in Sweden. Wifey headed off very early in the morning for Helsinki (Finland) for a meeting. Lucky me only need to catch a later flight in the afternoon. My trip back was via Stockholm-Bangkok-Singapore (for wifey it was Finland-Frankfurt-Singapore). As wifey's meeting in Finland was very short, she arrived back in Singapore only a couple of hours after me. Have not had time to add titles the photos but you can still check them out HERE! Phew! Just came back from a week in Denmark and Sweden. Gonna do some packing first before sorting out the photos and posting more details in this blog. Stay tuned!